Did you ever think in a zillion years that you'd ever see La Diva Renée singing in a food court? Oh my goodness, remember Endlessly? Yep, I was (and, let's be honest, still am) a little obsessed with that single. And then, there was the music video for Endlessly - complete with a bunch of circus-types juggling and what-not. Which, again, I kind of loved. But seriously, a food court? I mean - yes, she's in good company considering Yo-Yo Ma is accompanying her on the cello. Come on, though ... a food court? Now I give you that said food court was in the James R. Thompson center - which houses the offices of the State of Illinois - but, the center also boasts an art gallery, artisans shop, three floors of restaurants and shops, and 13 floors of balconies that surround a 160 foot rotunda. So, it's a shopping mall, right? I'm not going to lie to you - I judged. Sorry! I did. 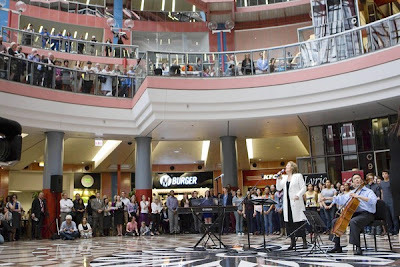 I saw the photos from the event and thought "Wait one-hot-minute ... what in the world is Shenénée doing singing in a shopping mall food court?" Full disclosure - yes, in my house we *do* refer to Renée Fleming as Shenénée. I'm not really sure why, but we do. Anyway, this last Monday Renée Fleming, who is currently the creative consultant for the Lyric Opera of Chicago and Yo-Yo Ma, the Chicago Symphony Orchestra’s creative consultant, joined forces for a spectacular event. Celebrating Citizen Musician and the importance of the arts in our daily lives - the surprise performance for more than 500 people, also included the choruses from Lake View High School, Chicago High School for the Arts and the Merit School of Music, along with members of the Chicago Symphony Orchestra. What is Citizen Musician? I'm glad you asked! Citizen Musician, whiched was launched by the Institute for Learning, Access and Training at the Chicago Symphony Orchestra in January 2011, is an organization that calls on all musicians (professional, young, and amateur), music lovers, and music teachers and institutions to use music to bridge gulfs between people, to create community and to inspire and transform lives. Do you know what is harder for me to believe than Renée Fleming singing in a food court? The fact that someone had to create an organization whose expressed intent is to do that which used to be the norm, rather than the exception: using music to create community and to inspire and transform lives. Welcome to our current society. So, I take back my judgment - whole heartedly. How better do you use music to create community, to inspire and to transform lives than to take music directly to the people. To where they eat. To where they do business. To where they live out their daily existence. Great job, Shenénée La Diva Renée, Yo-Yo Ma and all of those who help Citizen Musician with it's mission. Here's to you continuing to inspire and transform lives!